Meredith Louise Vieira (born December 30, 1953) is an American journalist, television personality, and game show host. 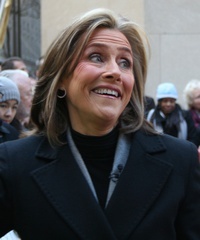 She is best known for having been the original moderator of the ABC talk program The View and co-host of the long-running NBC News morning news program, Today. She currently contributes to Dateline NBC and Rock Center with Brian Williams, was the former host of the syndicated version of Who Wants to Be a Millionaire, having replaced Regis Philbin in 2002. She also presented Intimate Portrait, a series on Lifetime. In 2014, she will begin hosting a daytime talk show. This webpage uses material from the Wikipedia article "Meredith_Vieira" and is licensed under the GNU Free Documentation License. Reality TV World is not responsible for any errors or omissions the Wikipedia article may contain.